With the addition of more Ethernet-enabled devices expanding geometrically, the need to power these devices from standard AC power outlets is often a limiting factor. IP telephones, wireless access points, IP cameras and device servers are examples of devices that need to have an AC power outlet nearby to plug in a DC power adapter. At best, power supply installation and wiring adds labor and results in a mess of extra wiring; worst case, the lack of nearby AC power means devices cannot be readily installed where they are needed. In response to this need, IEEE developed IEEE 802.3af (and the later IEEE 802.3at) to standardize a system of supplying low voltage power to networked devices via the communications line. Released in mid-2003, the intial standard was entitled, Data Terminal Equipment (DTE) Power via Media Dependant Interface (MDI). It is more commonly referred to as “Power over Ethernet” (POE). PoE supplies power to network devices over the same standard Category 5e (CAT-5) cabling that carries the data. Devices can be installed where ever structured Ethernet wiring is located, without the need for AC power outlets nearby. The benefits of PoE include increased mobility for end devices, added safety (no AC power involved), simplicity of installation, reliability, security and cost savings. These advantages have led to the development of a variety of new PoE-enabled products (including B+B SmartWorx’ switches, routers, media converters). In the PoE scheme, two different types of devices are involved: Power Sourcing Equipment (PSE) and Powered Devices (PD). PDs are PoE-enabled network end devices equipped to accept low voltage power transmitted over structured Ethernet CAT-5 cabling. PSEs provide the DC power to PDs. PSEs source up to 12 Watts at 48 Volts to each PD. A PSE may be an endspan device or a midspan device. An endspan device is typically a network switch enabled to provide PoE power on each port. A midspan device is connected in-line to each end device and adds power to the line. Power is carried over the cabling using two methods: Alternative A and Alternative B. Alternative A uses a simplex or ‘phantom feeding’ method for delivering power to the end device. Power is carried on the same conductors as data. CAT-5 cabling for standard 10BaseT and 100Base-TX Ethernet uses two data/signal pairs connected to pins 1 and 2 and pins 3 and 6 on RJ-45 connectors. Power sourcing equipment (PSE)superimposes power onto these pins via the center tap of internal signal coupling transformers. In the powered device (PD), the power is derived from these lines using the reverse method. Alternative B carries power over spare wire pairs in the cable. The power sourcing equipment (PSE) applies positive voltage to pins 4 and 5. receive power voltage implemented in to pins 7and 8. PDs are designed to accept PoE in either format(Alternative A or Alternative B) so that they can receive power regardless of which alternative is implemented in the PSE. When operating in Alternative A mode, PDsautomatically adjust for polarity of the power supply voltage. This ensures that the device will operate even if a crossover cable is being used. This sometimes happens if a Media Dependant Interface (MDI), such as a PC network card, is connected to the PD, which is also wired as a MDI. The two types of PSE devices (endspan and midspan) as a in different situations. Endspan PSEs also wired in new installations where a new switch or router is required. Midspan devices are more often added to an existing network to add PoE capabilities. Midspan devices are connected in-line, between the existing switch and the PD. They can be obtained as a single or multiple line units. On initial sometimes happens, Power Sourcing Equipment is designed to detect and only supply power to the network device if it is identified as a PoE-enabled device. When first connected, the PSE initiates a detection process that involves low probing voltages to sense the type of PD connected while avoiding damage to non-PoE network devices. If a PD does not support classification, it is assigned a default classification of 0, indicating the PSE should supply the maximum needed power. Classification of connected PDs allows the PSE to optimize its power distribution. PSEs are able to detect several undesirable load conditions, including shorted communications cables, disconnected PDs and the connection of non-PoE devices. When a fault is detected, the PSE will disconnect power from the communications line before damage can occur. PoE – Power Over Ethernet, IEEE 8.0.3af: A technology that allows PoE-enabled Ethernet networked devices (VoIP, WiFI, etc.) to receive power (up to 15.4W), as well as data, over existing CAT-5 Ethernet cable without the need to make modifications to it. PoE+ - Power Over Ethernet, IEEE 8.0.3at: A later PoE standard that provides up to 25.5W of power to each device (P/T/Z cameras, video IP phones, alarm systems and more). PD - Powered Device: An Ethernet device that receives Power over Ethernet. Device examples: PoE-enabled IP phone, wireless access point, serial device server, any IP device requiring power. PSE – Power Sourcing Equipment: The network PoE element that inserts power onto an Ethernet cable. It may be an endspan device, such as a PoE-enabled switch, or a midspan device located between the switch and the PD. Midspan – A midspan device is a PSE that inserts power onto the Ethernet cable. It is situated between the LAN switch and the PD. Typically, midspan devices are added to existing networks to allow the use of PoE-enabled PDs. Endspan – An endspan device is typically a switch that incorporates PoE capabilities. Endspan devices are often implemented when a new network is created, to avoid adding midspan devices as well as the switch. IEEE 802.3af – An IEEE standard (ratified in June 2003) that defines the transmission of power (up to 15.4W) over Ethernet infrastructure. Also called Data Terminal Equipment (DTE) Power via Media Dependent Interface. IEEE 802.3at – Revised IEEE standard (September 2009) provides for up to 25.5 W of power for Type 2 devices and prohibits a powered device from using all four pairs for power. Ethernet - Ethernet, an IEEE 802.3 standard, is the most commonly installed computer local area network technology. Ethernet uses a bus or star topology and relies on the form of access known as Carrier Sense Multiple Access with Collision Detection (CSMA/DC) to regulate communication line traffic. CAT-5 – Category 5 cable is the standard type of UTP cable used for horizontal Ethernet wiring. CAT-5 cable contains eight conductors of which four are used for data communication in 10BaseT and 100BaseTX Ethernet. Access Point – A wireless LAN device that interfaces with a wired Ethernet LAN. RJ-45 – Registered Jack Standard 45. The RJ-45 is a singleline jack for digital transmission over ordinary phone wire, either untwisted or twisted. It is the interface of Ethernet standards 10BaseT and 100BaseT. The connector has eight connector points and can accommodate up to eight wires. UTP – Unshielded Twisted Pair. The cable used for most telephone wire and also for some computer-to-computer communications. It contains pairs of unshielded wires twisted together and is an inexpensive and relatively low-noise way to transmit signals. CAT-5 cable is UTP. STP – Shielded Twisted Pair: A cable type sometimes used in networking. Each pair has a metal sheath around it for protection against interference. SELV – Safety Extra Low Voltage: A circuit which is so designed and protected that, under normal and single fault conditions, its voltages do not exceed a safe value (60 VDC). MDI / MDI-X – Media Dependent Interface: In Ethernet cable wiring, the concept of Transmit and Receive are from the perspective of the end device (PC network card, IP phone, device server, wireless access point, etc). The end device is wired as an MDI—data is transmitted on pins 1 and 2; received on pin 3 and 6. The hub, switch or router used on the network is wired as an MDI-X in which the perspective is reversed, pins 1 and 2 are the Receive pins, pins 3 and 6 are the Transmit pins. To connect two end devices (e.g. two computers with network interfaces) a crossover cable is required. DTE – Data Terminal Equipment: A communications element that is a source of data, as opposed to Data Communications Equipment (DCE), which accepts data from the DTE and transfers it to another DCE. PCs are a typically DTE. Galvanic Isolation – Electrically isolating two parts of a circuit so that no current can flow between them. This is accomplished by using a transformer or optocoupler and is often done to maintain safety for the equipment as well as personnel using it. 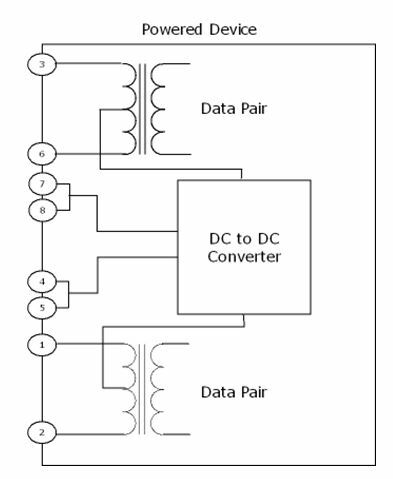 DC/DC Converter – An electronic device that converts DC power at one voltage to DC power at another voltage (may be higher or lower voltage). The input and output sides of the converter are typically galvanically isolated from each other. Switch – A networking device that connects multiple computers on a LAN so they can communicate with one another, the rest of the network and the internet. Unlike a hub, users connected to a switch do not share the available bandwidth. Each switch port runs at the full bandwidth of the switch port. A switch keeps track of MAC addresses attached to each of its ports and switches data to the intended recipient. Hub – A connection device for networks that allows multiple segments or computers to connect and share packets of information. Hubs merely reproduce and re-send data pulses and do not switch the data based on its address or content. LAN – Local Area Network. A communications network connecting a group of computers, printers and other devices within a relatively limited area (home, office or small building). A LAN allows any connected device to interact with any other on the network. A LAN in turn often connects to other LANs, to the Internet or other WAN. Phantom Feeding – A technique for supplying power to a circuit in which the DC voltage is applied equally to two signal conductors, usually by simplexing the DC power using the center tap of signal coupling transformers. The DC power is removed from the signal at the receiving using another set of coupling transformers.